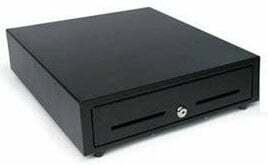 Star CD3-1616 - 16" x 16", Printer Driven, 5 Bill-8 Coin, 2 Media Slots. Includes interface cable. Star Micronics' CD3 Tradition cash drawer series are cost effective cash drawers that integrate seamlessly into any retail or hospitality environment with a standard printer communication interface and bottom exit cable, hidden from the customer's view. CD3-1616 Tradition cash drawer can accommodate to Canadian, United States, and Latin American currency types of 4Bill-8Coin, 5Bill-8Coin. The Star 37965600 is also known as Star Micronics	STA-37965600	.